OR the printed version also at £4.50 but plus postage. 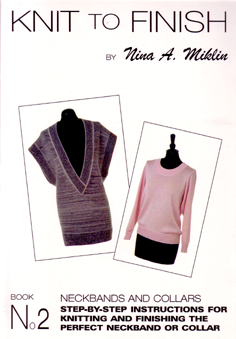 The books describe in STEP-BY-STEP instructions, all supported with close-up photographs and diagrams, the knitting and finishing techniques to achieve a professional looking garment. To follow any of the methods no additional tools or machinery other than the tools supplied with the knitting machine are required. All techniques apply to standard gauge machines as well as Passap/Pfaff and Singer. There are instructions for a basic horizontal and vertical front band with detailed instructions of HOW TO DETERMINE THE the size/length of a front band as well as how to calculate the positioning of the buttonholes. Frills are an easy contemporary style for wonderful day and evening creations and according to fashion gurus are going to be around for some time to come - from the very expensive to realistically priced outfits. For that reason there are a wide variety of frill designs and suggested applications - from the understated, discreet but stylish to the voluptuous and bold. Book No. 4 - Modern Trimmings and their Applications is available as PDF email attachment. Please send you order to nina.miklin@virgin.net we will then forward you an invoice via PayPal and as soon as we hear from PayPal we will send the book. Close-up of the finished 'Back-Sleeve Shoulder point'. No matter what the latest style might be the Classic Shoulder Line has retained its popularity, which it owes to its classical elegance for both Lady's and Men's wear. Originally employed only for the most exclusive knitwear produced by leading fashion houses, it is now applied to all types of knitwear. PART ONE of the book deals with the knitting aspects for this smart style, the instructions are based on a SAMPLE PATTERN for a cardigan and jumper. PART TWO illustrates the finishing of each and every seam from the very beginning to very end, supported with CLOSE-UP PICTURES and diagrams - see example on top featuring Step 9, PART TWO, Chapter Three - 'JOINING THE SHOULDER AND NECKBAND'. In PART THREE you will find the instructions for adapting a regular pattern with a basic shoulder and set-in sleeve to this style. 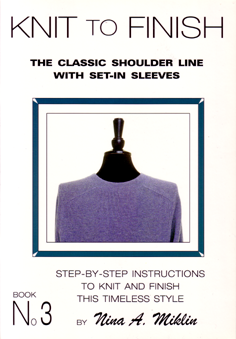 This book shows you how to knit and finish 14 different round and V-neckbands and collars; this includes the fully fashioned V-neckband in Stocking Stitch (Fig. TWO 1, DESIGN 08) and in Rib featured above, both are knitted/shaped and attached to the neckline on the knitting machine in one process; as well as four different methods of attaching a V-neckband to the neckline by hand. By applying the unique V-neck methods described in this book you will ensure a perfectly centred V-neck every time. 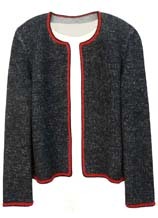 Many of the finishing techniques referring to the neckline, neckbands or collars can also be applied to other parts of a garment. For instance Page 20, Step 3 shows you how to join a ribbed neckband to achieve an 'invisible' seam, the same method can of course also be applied when joining a ribbed welt or cuff. The neckline is the most important part of any jumper or cardigan and by adding 10 minutes to your knitting you can ensure a perfect finish every time. 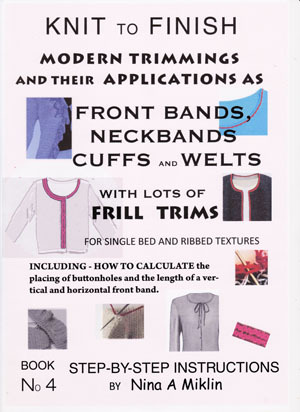 Throughout this book you will find great emphasis has been paid to various methods of marking the rows and stitches. This is an important part of any knitting but it is especially necessary for necklines. The easy to follow instructions with close up photos and attention to detail at every stage start with the shaping by putting stitches on hold to the steam pressing of the finished neckline. Following the methods described will not only produce a perfect neckline but it will have sufficient stretch to pass over the head even for a tight polo neck.